They told us we’d have robots. We just didn’t expect them to be so mundane! Chatbots are popping up all over the internet, and so far they’ve not tried to take over the world or seal shut the bay doors. No sales site is complete without one. And now they’re taking over Facebook Messenger. So what’s the big deal? Simply put, chatbots are getting a lot better at doing stuff you used to pay human beings to do. That frees up your human workforce to do stuff that the bots can’t (yet) do. It also means you need never delay a simple customer enquiry because you’re busy doing something else. There are over 1.3bn Messenger users, so the ability to multitask is invaluable. Chatbots are here: around 60% of millennials and Generation Xers in the States have chatted with one. And they’re here to stay. It’s reckoned that an astonishing 85% of customer service interactions will be with chatbots within the next two years. You know what that means: you’re either with them or against them. So what can your Facebook Messenger chatbot do for you? Well, in the first place they can put a voice to your FAQs and contact information. Not every consumer has the time to fish about for basic information like opening times or delivery costs. They want to ask a question and get an answer more quickly than it would take them to just go to your competitor. And it doesn’t have to be as basic as that. A well-trained chatbot can give out product details, answer questions, and offer alternatives. Suddenly, the browsing process becomes your way in. Let’s look it the other way. Sometimes it’s your business, not the customer, that needs to communicate. Say you run events, and you’ve had to cancel one. You don’t have time to reach out to everybody individually – so you could end up with some pretty angry customers. Instead, your chatbot can be programmed to do it for you, and quickly. Or if it’s good news – like a limited time offer – they can spread the word much quicker than your regular email marketing team. And they can do so in a personalized way, inspired by what you know about each customer from their data. So we’ve established that no business is complete without its own fleet of chatbots. (Okay, just one might be enough). But if you’re not technically-minded, how do you go about building one? There are several low-cost options in the form of online tools such as Chatfuel and Botsify. You start by generating a new bot and connecting it to your Facebook business page. You can then write an opening message for it, and choose the features that you’d like it to make use of – for example, images or quick replies. You then add some of the questions that your customers tend to ask. Start with your existing FAQs if you have them. Add the questions one at a time, and then add the answers in a friendly tone. You can test it before you make it public so that you know it’s giving the answers you want. Folk need to know that they’re dealing with a chatbot, not a human – but that doesn’t mean that interpersonal skills are out the window. Your chatbot is providing customer service, and it should be polite, friendly, and sympathetic. You can even give your chatbot little human foibles, like saying “umm” and “err.” We actually use these sorts of sounds to punctuate a conversation, in other words to regulate its rhythm. Instantaneous, clinical replies can be turn-off, so choosing some character traits that fit your brand can be more effective. It needn’t be “umm” – it could be “okay.” It should also talk in a natural way, for example saying “didn’t” instead of “did not.” This will make your customer more relaxed and open. Your chatbot can choose to ‘listen’ from time to time. It’s another way of regulating that rhythm. Teach it to know when your customer is thinking, so that your chatbot doesn’t interrupt. Sometimes when you just let someone keep talking and talking, they finally say what’s really on their mind. So you’ve built a charming, knowledgeable, and eloquent (but not too eloquent) chatbot. How do you get your customers to chat with it? It’s time to utilize that call-to-action button at the top of your Facebook Page. This is where you can add a video or link, but for the time-being you should change it to ‘Send Message.’ That way your customers can always contact your chatbot quickly without having to click through multiple options. You can also make your bot more visible to the general Facebook public by going to the Messenger Platform tab and changing your ‘Discover Settings’ to choose how and where your bot will appear across the Facebook platform. And there’s no need to restrain the bot to Facebook. Direct your website visitors to its presence with a plug-in – which again, you can do in your Facebook Page settings. 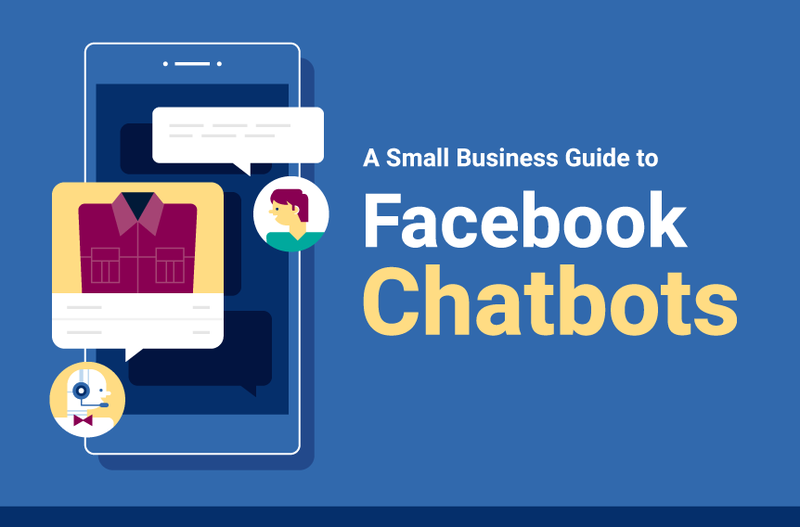 This new step-by-step guide to Facebook chatbots will give you all the info you need to work through the process, even if you’re new to this kind of thing. Facebook chatbots are getting pretty big pretty quickly, so now is the time to engage – or fear the wrath of our robot overlords.